A Year of Being Here: Wang Wei: "Walking in Mountains in the Rain"
I can hear boatmen singing. 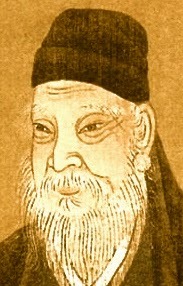 "Walking in Mountains in the Rain" by Wang Wei, from Five T'ang Poets. Translated from the original Chinese by David Young. © Oberlin College, 1990. Many thanks to Albert Bellg for suggesting this poem, whose translator, he writes, was one of his English professors at Oberlin. 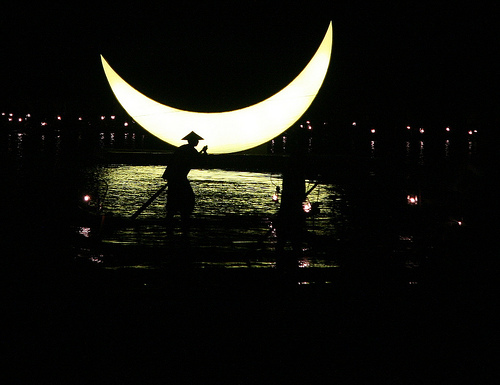 Art credit: "Silhouette against Yangshuo Moon in China," photograph by johey24. Caption: "A cormorant fisherman rows his little bamboo boat against the backdrop of a giant moon on the Li River, Yangshuo, China."